FC Barcelona traveled to Huesca without many of their starters who stayed behind in Barcelona. Messi and Busquets were dropped to gain some rest while Piqué and Suárez could not play because they were serving a one game ban and Sergi Roberto stayed behind because of a knock in his left knee. The starting lineup for today’s game consisted of Ter Stegen in goal and as captain while B players Wagué and Riqui Puig, and Murillo and Todibo had their first team league debut. The rest of the lineup consisted of, Umtiti, Arturo Vidal, Aleñá, Malcom, Boateng and Dembélé. 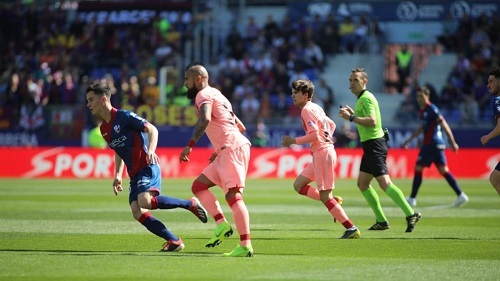 Barça were donning their pink third kit against the hosts Huesca and came close to scoring a few times but were denied by the post or let down by their poor finishing. Nonetheless, the game ended in a scoreless draw as they remain in the driver’s seat for their 26th league title. Barça will now shift their attention to their crucial second leg tie against Manchester United at the Camp Nou on Tuesday. SD HUESCA: Santamaría; Miramón, Pulido, Javi Galán, Etxeita (c); Juanpi (Melero 60′), Rivera, Moi Gómez; Chimy Ávila (Gallart, 88′), Enric Gallego & Juanpi. FC BARCELONA: Ter Stegen (c); Wagué, Murillo, Todibo, Umtiti, Malcom; Aleñá (Arthur, 80′), Arturo Vidal, Riqui Puig (Jordi Alba, 67′); K.P. Boateng & Dembélé (Coutinho, 67′). Cautions: Todibo (42′); Wagué (90′); Pulido (90’+1′). Previous PostBarça are Finally Ruthless. Next PostBarça back to the Champions League Semi-Finals after 3-0 victory over Manchester United.